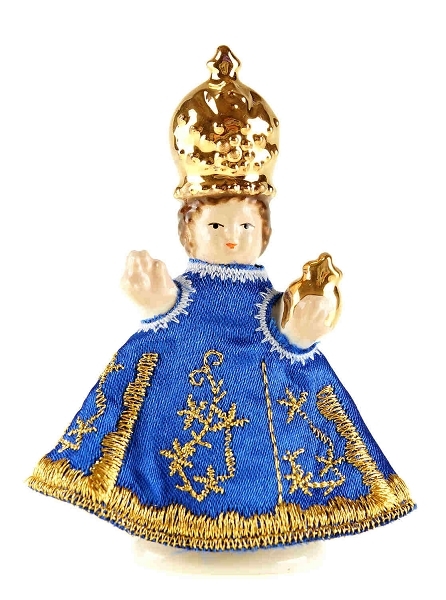 Small genuine ceramic figure made as replica of the famous Infant Jesus of Prague holy statue, original of which is located in the Church of Our Lady Victory in the Lesser Town of Prague. Designed and hand made in the Czech Republic by local ceramic works. Ceramic body is dressed in embroidered coat elaborated in high quality and detail. Golden surfaces are coated with 24 carat gold. Nice spiritual memory of your visit to Prague. - Dimension: height 8 cm (3.2'). - Color selection: white, yellow, red, green, blue.